For many it’s just a toy. For some, it’s an incredible puzzle. And to a select few, it’s the ultimate tool with the power to beat time, time after time. The world knows them as speedcubers. They may seem ordinary and extremely poised in their everyday life. But, put a Rubik’s cube in their hands and they become beasts. As fast and furious as one can be. Exide, a brand that believes in the power of relentless passion and inner spirit, celebrates these dynamic human values under its newfound #WhatDrivesYou ideology. And in its journey of upholding such people with extraordinary drive, EXIDE came across the curious and ingenious Siddhikant Mishra, from Bhubaneswar. A math major by qualification, and a speedcuber by passion. An ordinary guy who holds unbelievable records in speedcubing. 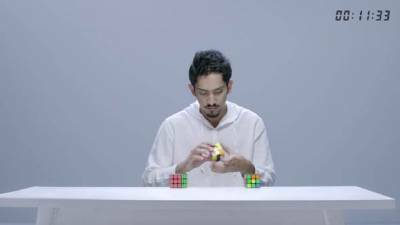 Solving the most complex patterns of Rubik Cubes in a few flicks of his fingers. At times, even without looking at it. The recently released campaign created for Exide, by J Walter Thompson, #DrivenBySpeed has already garnered over 1.3 million views and 1000+ shares across digital platforms. Along with this, the video trended on Twitter with a reach of 56,34,672 and a native platform reach of 1 Lac+ with the numbers increasing day on day. It’s a drive that’s gathered pace like never before!